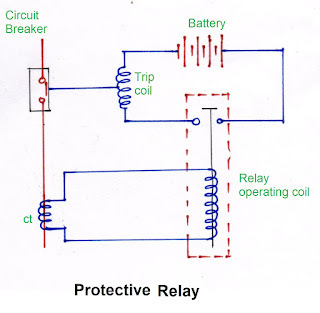 A relay is an automatic device which senses an abnormal condition in an electric circuit and then activates the circuit breaker to isolate the equipment from the fault. A protective relay may be defined as an electric device interposed between the main circuit and the circuit breaker in such a manner that any abnormality in the circuit acts on the relay,which in turn, if the abnormality is of a dangerous character, causes the breaker to open and so to isolate the faulty element. The relay ensures the safety of the circuit equipment from any damage which might be otherwise caused by the fault. A protective device is a device that detects the fault and initiates the operation of the circuit breaker to isolate the defective element from the rest of the system. All the relays have three essential fundamental elements ( sensing or measuring element) responding to the change in the actuating quantity, comparing element for comparing the action of actuating quantity on the relay with a pre-selected relay setting and the control element accomplishing a sudden change in the control quantity such as closing of the operative current circuit. Primary winding of the CT connected in series with the main circuit to be protected. 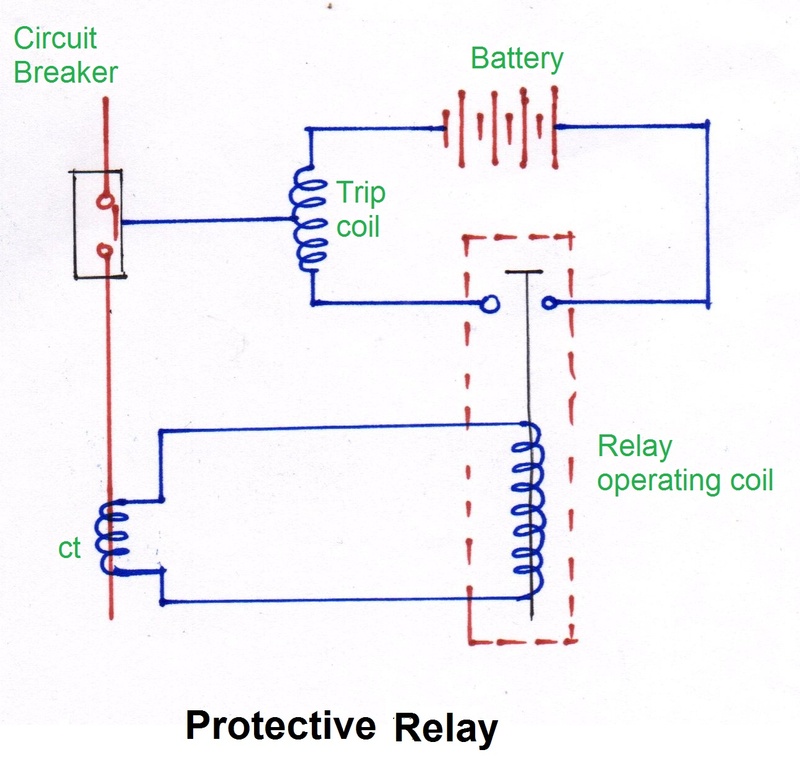 A protective relay is a device that detects the fault and initiates the circuit breaker to isolate the defective element from the rest of the system. Selectivity: It is the ability of the protective system to select correctly that part of the system in trouble and disconnect the faulty part without distributing the rest of the system. Sensitivity: The relay in the power system should be as sensitive as possible in order that it shall operate fro low values of fault current. However, a protection with high degree of sensitivity is more complex and uses more equipment and circuitry. Speed: Protective relaying should disconnect a faulty element as quickly as possible to improve the quality of service, increase safety of life and property, increase stability of operation and minimize damage to equipment. Reliability: It means that the protective relaying must be ready to function, reliable and correct in operation at all times under any kind of faults. Correctness of design, maintenance and supervision increases the reliability. Simplicity: of construction and good quality of the relay, simple the protective scheme and the lesser the number of relays, circuits and contacts, the greater will be its reliability. Protective relaying may be classified in several ways. According to timing characteristics of protective relays, they can be divided into instantaneous, definite time lag, inverse time lag and inverse definite minimum time (IDMT) lag relays. In induction type of relays the time lag may be achieved by employing a permanent magnet which is so arranged that the relay rotor cuts the flux between the poles of this magnet. Such a magnet is called the "drag magnet". In other types of relays this may be achieved in two ways. Firstly, when a series connected overload trip coil is used, an oil dash pot can be attached in which is a piston connected to the lower end of the solenoid plunger of the relay. In case of fault when the plunger is pulled, the piston immersed in the oil retards the plunger motion and thus provides the necessary drag or delay in the relay operation. When the trip coil is transformer operated, time delay is achieved by connecting a time-limit fuse across the trip coil terminals i.e in parallel. This fuse should have an inverse time current characteristic and will normally carry the CT secondary current to by-pass the trip coil. As and when sufficient current occurs to "blow" this fuse, the whole current is then transferred to the trip coil which operates to trip the circuit breaker.